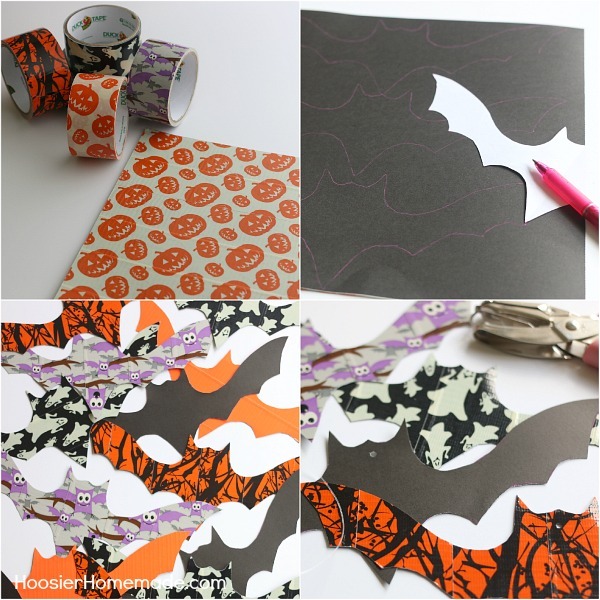 Ghosts – Goblins – Bats – and Witches Brew – Greet your guests and trick-or-treaters with these easy to make Halloween DIY Decorations with only a few supplies! Grab the kids! 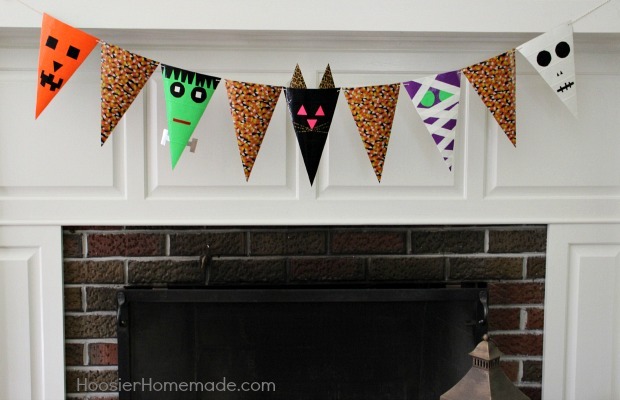 It’s time to decorate for Halloween! When my boys were young, we used to decorate our home for every holiday, and Halloween was no exception. 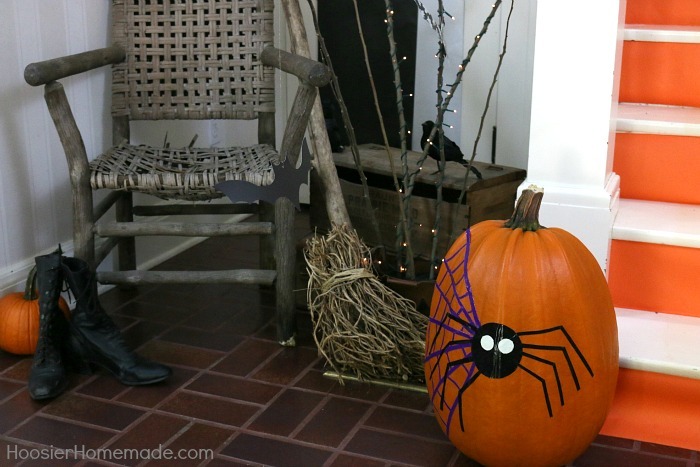 We would spend hours carving and decorating pumpkins, hanging Halloween decorations up around the house and outdoors. As the boys have gotten older, and our lives are busy with work schedules and school, we haven’t been decorating the house as much. The Jack o’ Lantern steps are the focal point of the Halloween Decorations. 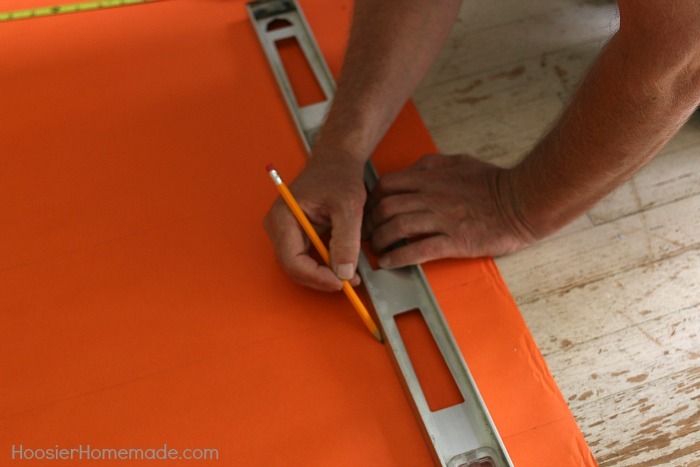 After we sketched out and measured, they were easy to create. 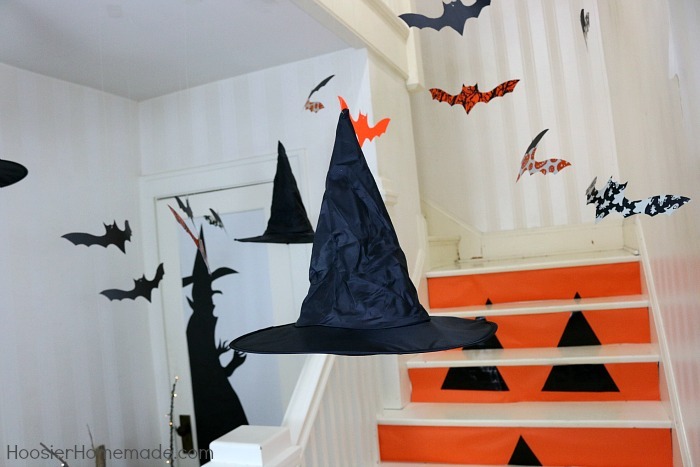 The bats and witches hats hung from the ceiling added a bit of spookiness to the Halloween Decorations. We punched a small hole in the top of the hat and used fishing line to hang the hats as well. 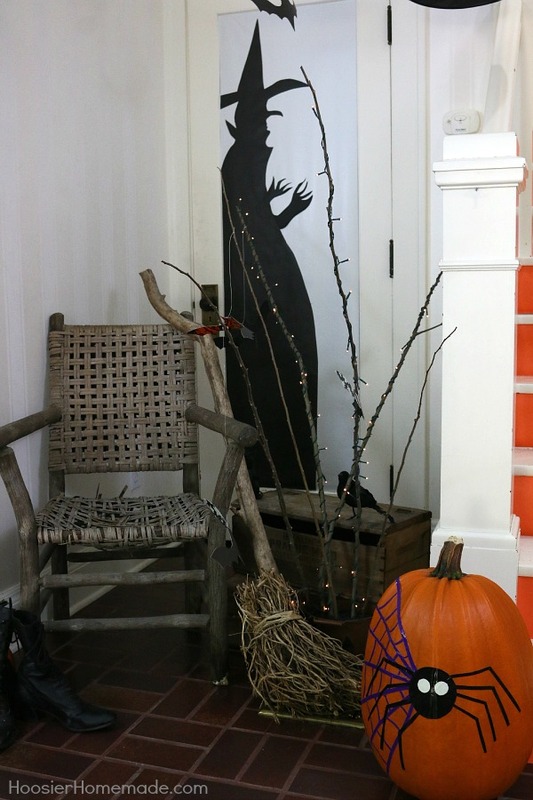 The witch silhouette, her broom, boots and a decorated pumpkin finish out the area. Now – let me show you how to make them yourself. The first step is to create the bats. After the bats were done, it was time to begin creating the Jack o’ Lantern steps. Figuring out the measurements and tracing it all out took a little time, but it wasn’t hard. And if you want to use our instructions, it will be really easy. Measure the width of each step. Ours are different because of the railing. Mark the paper for each rise in the stair. Ours are 6 1/4 inch. Measure and mark each stair on the paper. Then we decided on the face and drew templates using craft paper. For the mouth, we used a very large platter to get the circle on the bottom. And then laid them out on the paper to be sure the size was what we wanted. 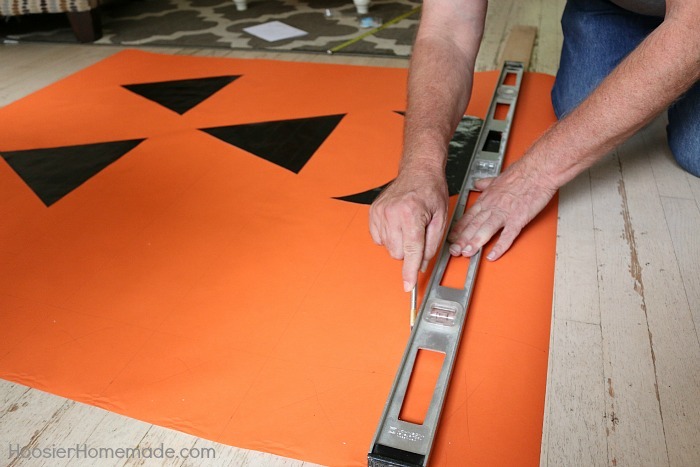 Next, each template was covered in black Duck Tape and the excess was cut off with an X-Acto knife, using a ruler for the straight edge. Then we laid the face back onto the paper to be sure is was positioned right and attached it to the paper with adhesive roller. Doug used a long piece of wood underneath the paper for stability, and the level for a straight edge. 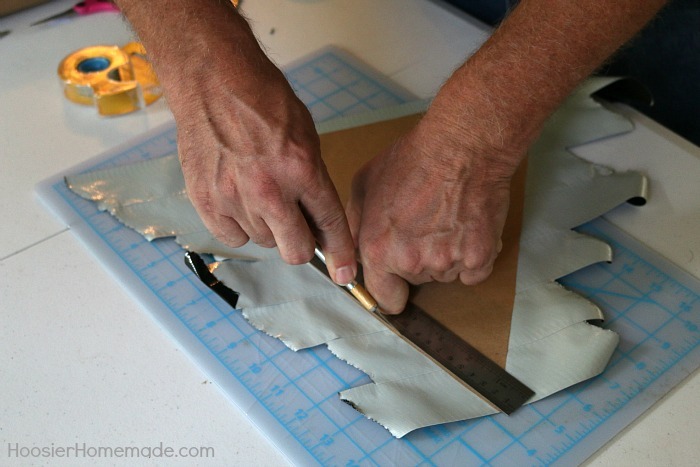 Then cut each of the pieces for the steps. 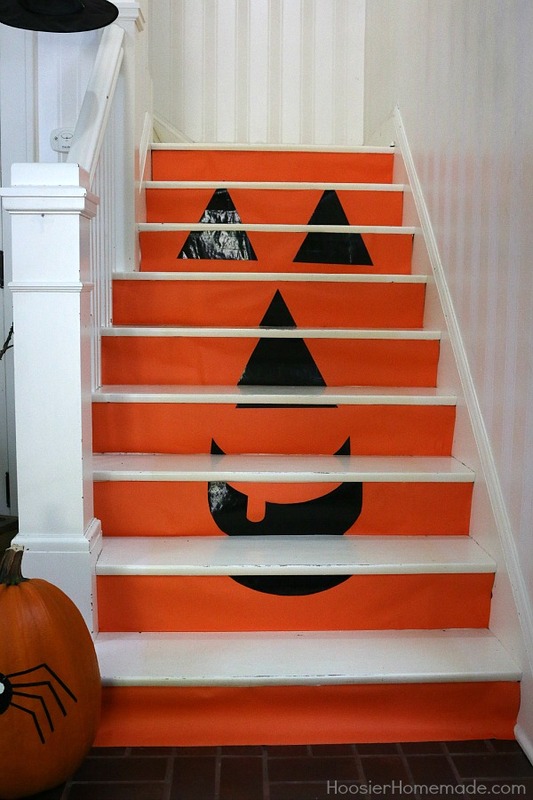 To attach the pieces of paper to the stairs, we used double sided tape. The bats and hats were hung by the fishing line and simply taped to the ceiling. Halloween wouldn’t be complete without a decorated pumpkin. We used Duck Tape to add the spider and his web onto the pumpkin. His eyes are made with Duck Tape Glow-in-the-Dark Tape. 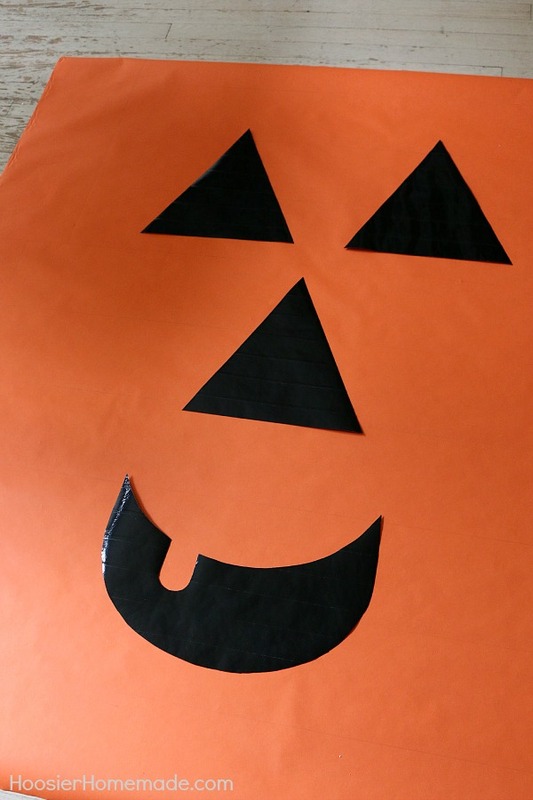 Finishing out the rest of the Halloween DIY Decorations, are the silhouette of the witch. We covered the door with white paper, and then cut out the witches silhouette from black paper. I drew her free hand after a little measuring, but I bet you could find one at a craft or department store. The chair is one that we had outside. And the sticks we cut from the yard and added tiny battery operated light sets that we found at Hobby Lobby in the Christmas area. The broom is one that we made years ago for our Halloween Porch Decorations. 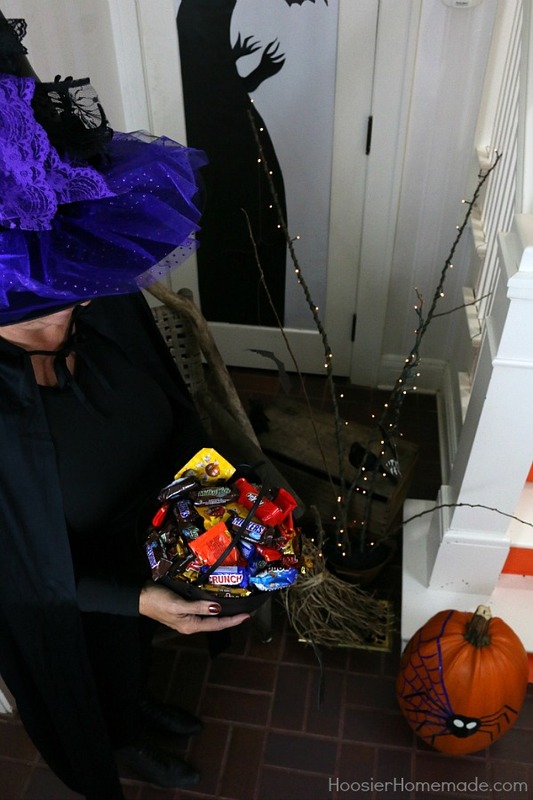 And of course it wouldn’t be Halloween without some goodies for the trick-or-treaters. The DIY Decorated Witches Hat makes another appearance. I couldn’t be more excited with how our Halloween DIY Decorations came together. What do you think? 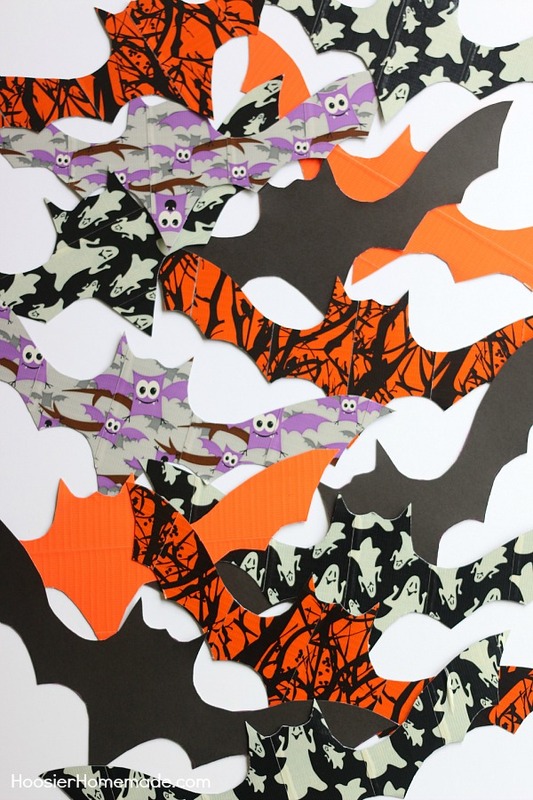 You may also like the Halloween Banner we made using Duck Tape. Join us for Halloween Tricks and Treats! This is such EPIC decorating ! It packs quite a punch without spending a ton of money. Just love your original ideas. Hi Liz – Loving your decorations! What a great idea for the stairs, I never have never seen this anywhere. Isn’t Halloween fun? It’s my favorite holiday too! super cute! 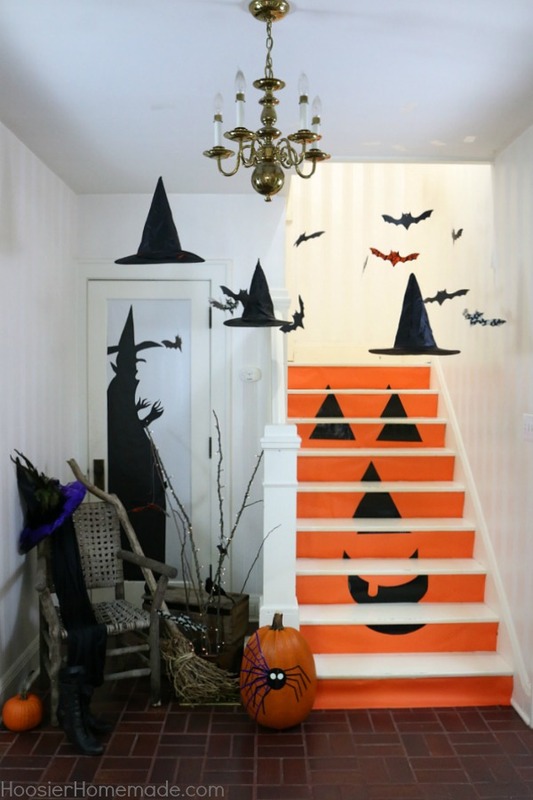 I love the witch hats and the amazing jack-o-lantern stairs! Hi, Liz ~ All of these decorations look amazing! I especially love what you did with the stairs. So creative! I’m definitely pinning this, so that I can refer to it next year. Thanks for sharing with us at the Merry Monday Link Party! Hope to see you again on Sunday night! Too cute. You are so clever! This is adorable! I can’t get over that staircase, I’m so doing that next year!! AB.SO.LUTE.LY FAN.TAS.TIC!!! so incredibly creative. 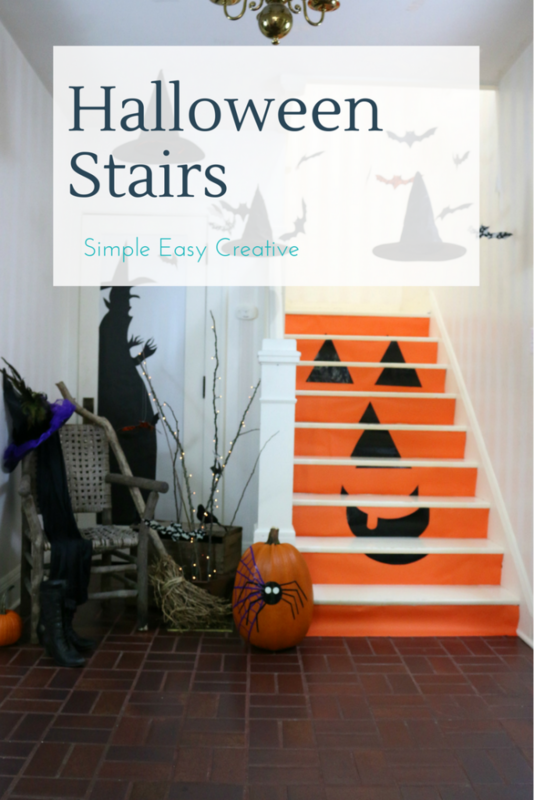 I popped over here from Hometalk for your Christmas mantle and got so sidetracked with your Halloween staircase!! THIS IS AMAZING DECO! LOVE IT, THE STAIRS ESPECIALLY, WHAT A GREAT IDEA! So excited you like it Katrin! Thanks for stopping by! OMG, this is amazing!! I LOVE this! So wish I could find a spot in my house to do that! The bats are so adorable!! I’d love to have you come over and link your post up to my craft party which starts at 7pm EST. and is new every Thursday! I also pin every post! So excited you like the Halloween decorations! Thanks so much for stopping by! These decorations are absolutely fantastic! I love everything! 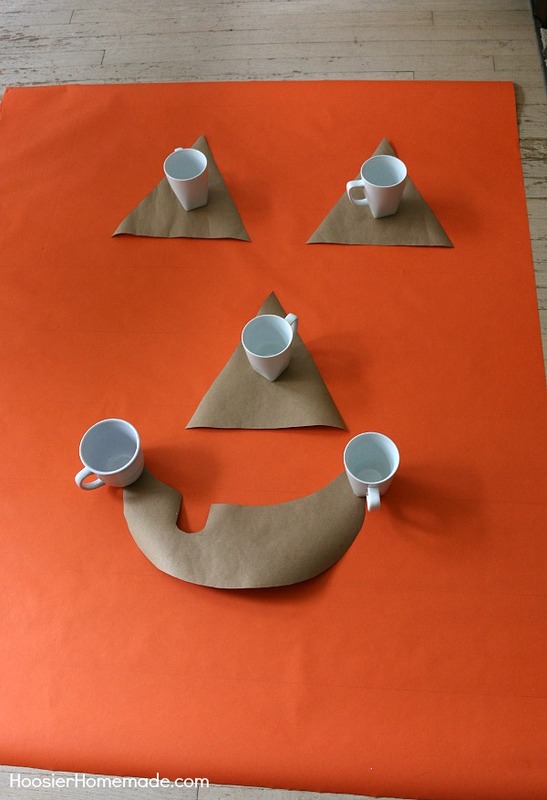 Visiting from Merry Monday and pinned Have a great week and a happy Halloween! Thanks so much for stopping by Cindy! So excited you like the Halloween Decorations! So cool! Love love love the stairs! Thanks so much Debi! So excited you like the stairs! Thrilled you like the Halloween decoration, Sam! Thanks so much for stopping by!